WALLS & ROOFS takes a closer look at the use of colour in the building designs that won the 2015 World Architecture Festival (WAF) Innovative Use of Colour Award and the WAN Colour in Architecture Award 2015. 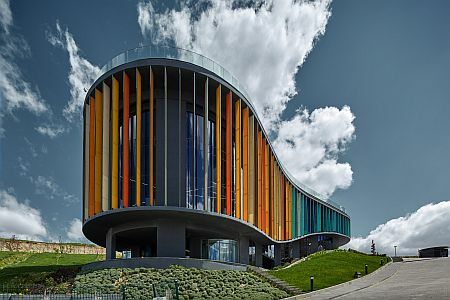 The winner of the 2015 World Architecture Festival (WAF) Innovative Use of Colour Award, the ONS INCEK residential project’s showroom in Ankera, Turkey, features a facade with numerous repetitive vertical coloured glass panels. Designed by Yazgan Design Architecture, the exposed concrete structure’s grey colour provides a unified background which helps to accentuate the vibrant panels. Three primary colours of turquoise blue, a warm green and deep yellow were identified, and gradients of these colours move the eye along the contours of the building. At the top of the multi-levelled building, signalling the entrance to the showroom, the panels are cool in colour. Moving around the envelope, the gradient of the colours becomes warmer to signify the dramatic dip in topography. The longest panels are 10m in length. The varying colours that are brightened up in the sun or muted by shadows, together with the different glass lengths, create visual movement around the building. To visually connect the project showroom to the rest of the residential development, three towers in the complex are also wrapped in the same coloured glass panels. Fortunen AS won the WAN Colour in Architecture Award 2015 for using colour to integrate different functional areas with clear usability and tie together the exterior and interior of the Bønsmoen Primary School in Norway. A renovation project, an existing secondary school from the 1960s, has been extended and transformed to house a primary school with a health and resource department. In the new design, the existing strict column-and-beam system was transformed with circular forms and warm colours ranging from red to green. Each grade has its own group of colours which distinguishes the areas for the different age groups, both indoors and outdoors, with cylinder-formed entrances also in the different colours for each grade. In addition, colour is also used as leading elements for the disabled. The purpose of the chosen colours is to give a visual play, whilst acting as a functional organisation and identification tool. The aim is to encourage movement through the environment and not only promote physical form, but also create visual experiences with colours. Fortunen believes that movement stimulates learning, such as walking around, climbing and playing. Full thanks and acknowledgement are given to Fortunen AS, WAN Architecture Awards and v2com newswire for the information given to write this article. Caption: The ONS INCEK Showroom won the 2015 World Architecture Festival (WAF) Innovative Use of Colour Award.